A collection of 70+ related songs with with sheet music & lyrics. THE THIRD EDITION OF THE ILLINOIS SONG BOOK. 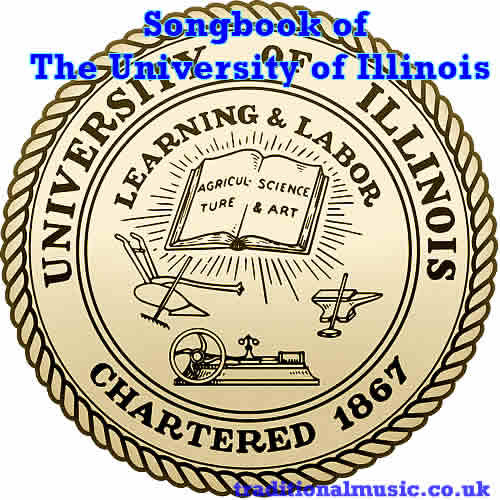 THE University of Illinois Song Book is published under the auspices of the Women's League of the University of Illinois, in response to an urgent demand from both the faculty and the student body. The need of rousing" songs which belong solely to our own University has long been felt and new material in this line has been secured as the result of song contests which have been held from time to time during a period of two years. The collection now completed con­sists of old and new songs peculiarly Illinois' own, and the general college songs which have been favorites in this and other colleges for years. If this book succeeds in bringing about the more general singing of college songs, especially of Illinois songs, we shall feel that it has filled a want long felt in the University community, and that the efforts of the Women's League in this direction have not been in vain. The committee wishes to acknowledge the assistance of Professor Frederick Locke Lawrence, Mrs. Constance Barlow-Smith, and Mr. Thatcher Howland Guild, who so ably judged the songs in the recent contest. We are further indebted to Mr. Guild for allowing us to include his song, "Illinois Loyalty" and to Miss Winifred Forbes and Dr. John Hancock McClellan for rearranging material, and to Mr. Victor George, Jr. for his cover design and frontis page. To all these, and to all others who have aided in the preparation of this book we wish to express the heartiest appreciation. WlLLABELLE WlLSON, Louise Shipman.